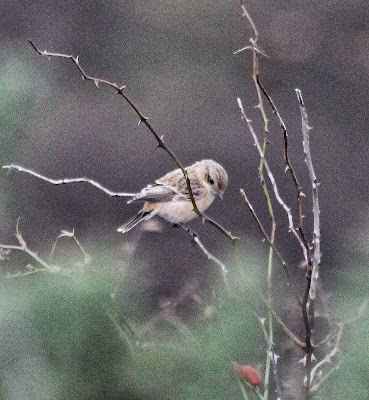 A fine SIBERIAN STONECHAT discovered by Scalby Beck late morning was the clear highlight of the day, it frequented the area of long grass at the top of Scalby Nab but was fairly mobile and often elusive in the strong wind. Other migrants seen between Stoupe Brow and Castle Hill were 1 Merlin, 2 Woodcock, 43 Skylark, 14 Meadow Pipit, 49 Robin, 52 Blackbird, 74 Redwing, 7 Song Thrush, 20 Fieldfare, 2 Blackcap, 6 Chiffchaff, 27 Goldcrest, 11 Brambling, 3 Lesser Redpoll, 4 Siskin, 1 Snow Bunting (Long Nab), 3 Reed Bunting and 3 Yellowhammer. 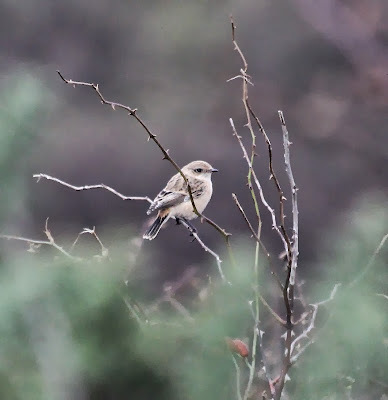 On the move south were 12 Skylark, 19 Meadow Pipit, 2 alba and 3 Goldfinch.